When Bob and I set out from Zitacuaro for San Blas on the Pacific Coast of Mexico, our spirits were high. Being a birding hotspot, our destination had us filled with anticipation. 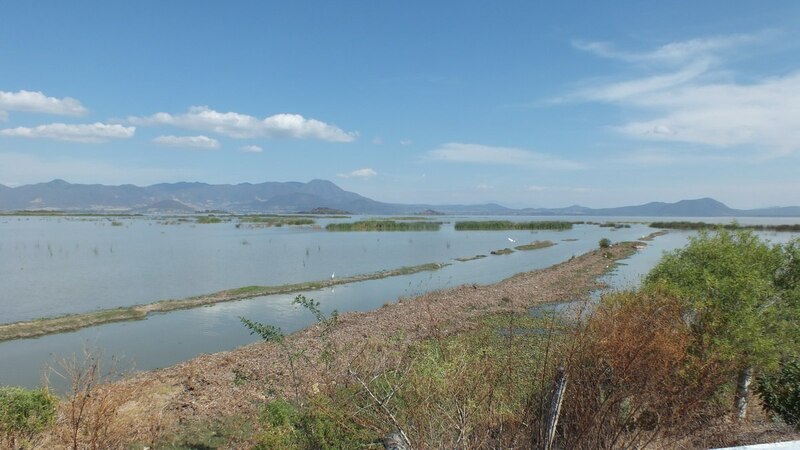 What we did not expect to find was the lush aquatic environment and the prolific population of shorebirds at Lago de Cuitzeo, which is found along Toll Highway 15D still in the State of Michoacan. We had selected our route to give us peace of mind and provide the quickest passage from point A to point B, given that it was an incredibly long distance that we had to cover in one day. 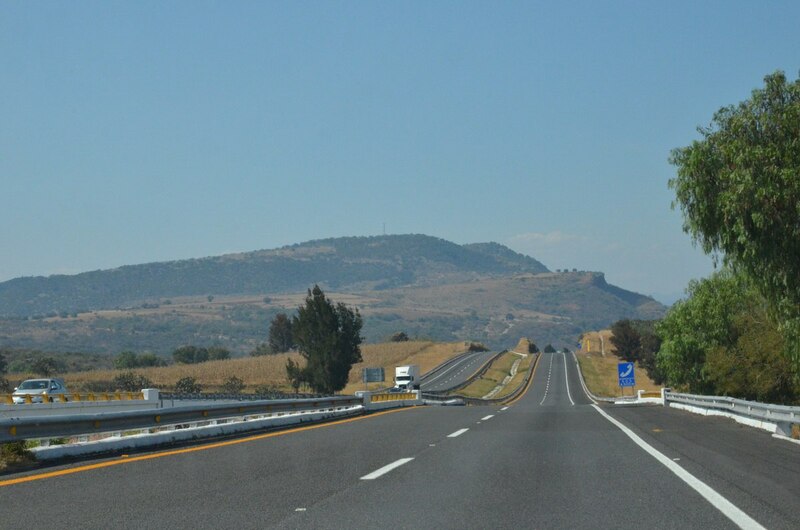 The toll highways are well maintained and secure so drivers are able to maintain high speeds without concern about damage to their cars or interference. 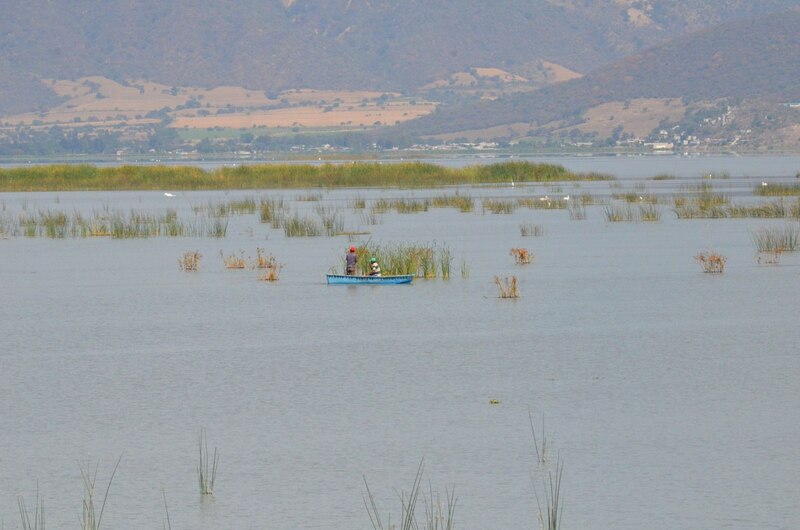 Our first glimpse of Lake Cuitzeo intrigued us but it gave nothing away as to the rich bird life along its shores. We were buzzing along unimpeded because volumes of traffic were not an issue given the frequent toll booths and cost of using the highway, but the toll roads are well used by trucking companies so we were ever mindful of the forceful winds when they would pass us by. 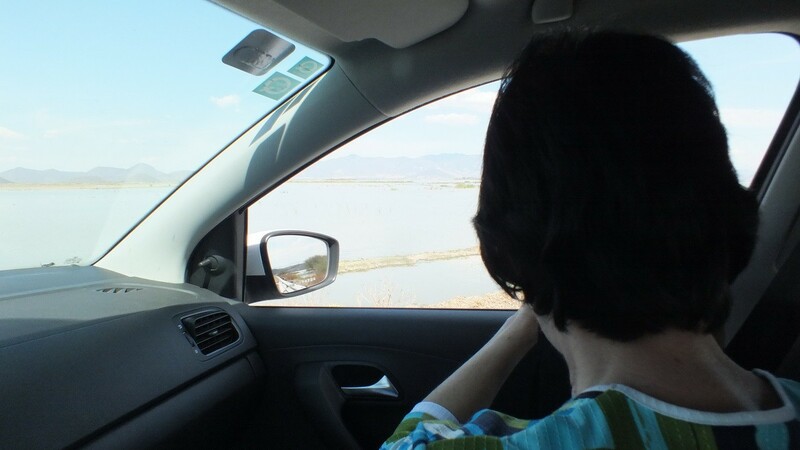 When the terrain alongside the highway opened up and gave us a full view of Lago Cuitzeo (Lake Cuitzeo), we were enthralled by its vastness and interesting topography. 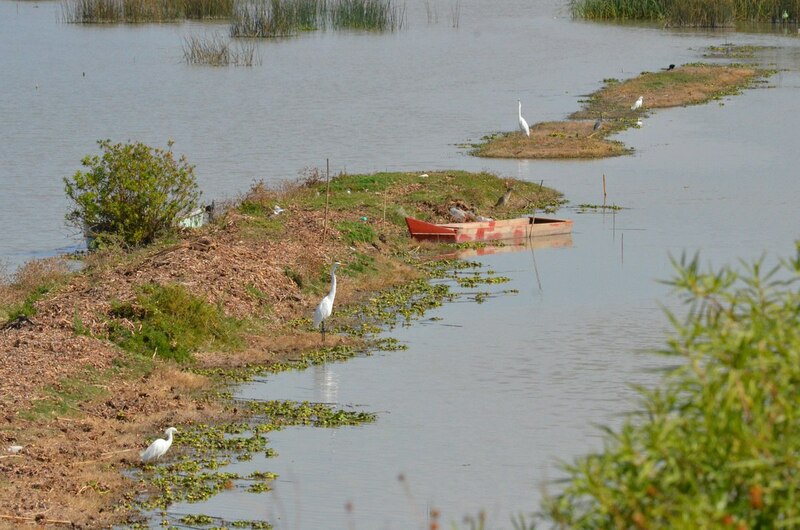 The lake is astatic meaning that the water levels fluctuate frequently, and the levees deposited by previous flood waters, in combination with great swaths of marshland, had tempted a number of egrets to stand and bide their time. Bob drew the car up along one stretch of guardrail where we thought the shoulder of the road wide enough to keep us safe from passing vehicles. We did not turn off the engine because we could only allow a few moments to enjoy the sights, but while we parked there, the turbulence caused by fast-moving trucks shook our car like some minor earthquake every time one whizzed by. Bob and I became aware of much fishing activity taking place on the water and along the shore but also started to notice a number of different bird species previously unknown to us. 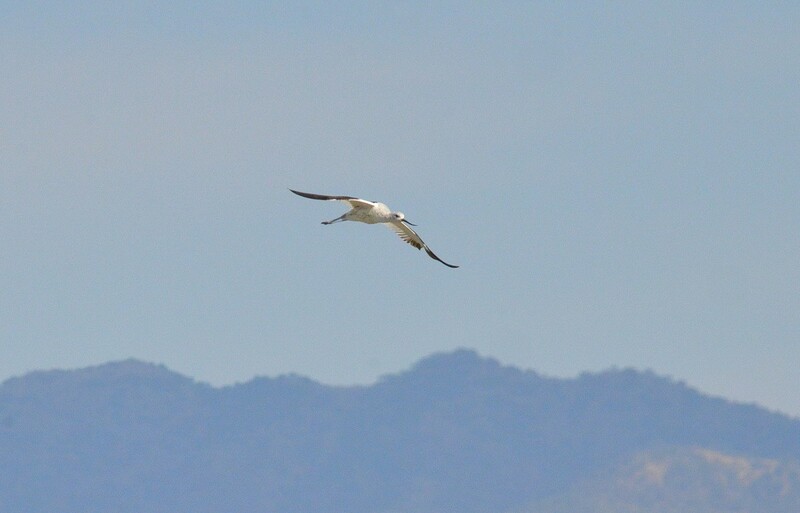 As I photographed the cluster of fishermen and shallow dories in the distance, this bird with a long curved bill flew into my frame. 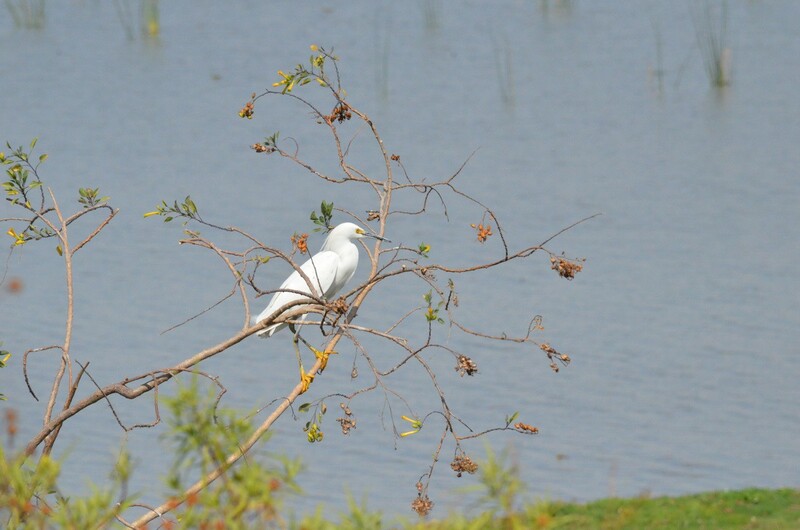 Next thing you know, Bob pointed to one of the same birds just below the embankment at the edge of the lake. 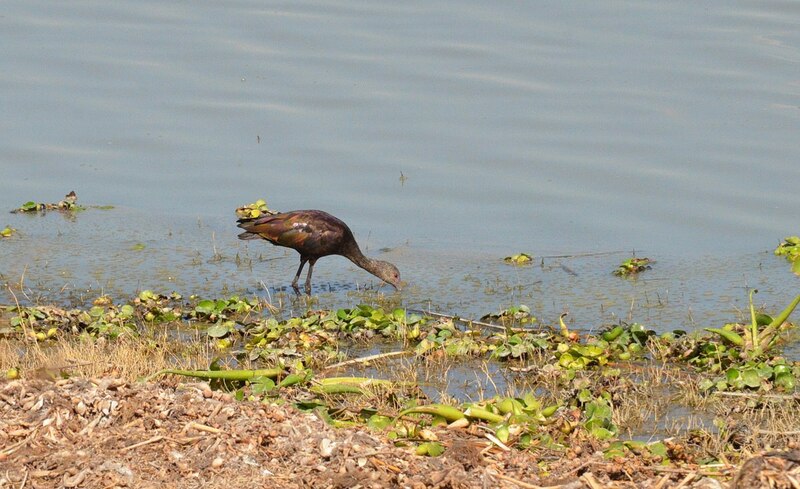 This White-faced Ibis was wading in the shallows in search of food, which could include any number of invertebrates such as insects, leeches and earthworms, or vertebrates including crayfish, frogs, newts and fish. 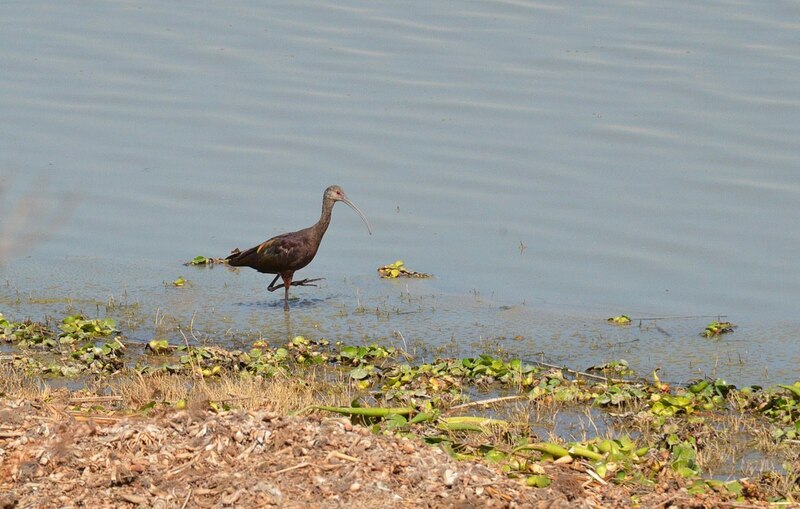 By probing the soft mud of the lake bottom with its long, sensitive bill, White-faced Ibises are capable of feeling the prey and then snap their bill shut and pull out their catch. Frogs are no match for the Ibis’s decurved bill that is also used to capture insects and snails from plants sticking up above the water’s surface. 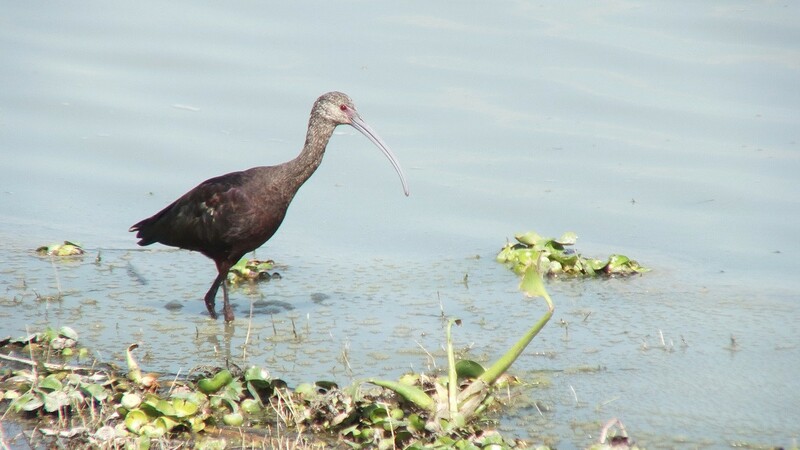 White-faced Ibises prefer to wade in the shallows of freshwater marshes or even are content to forage in flooded pastures or irrigated fields. 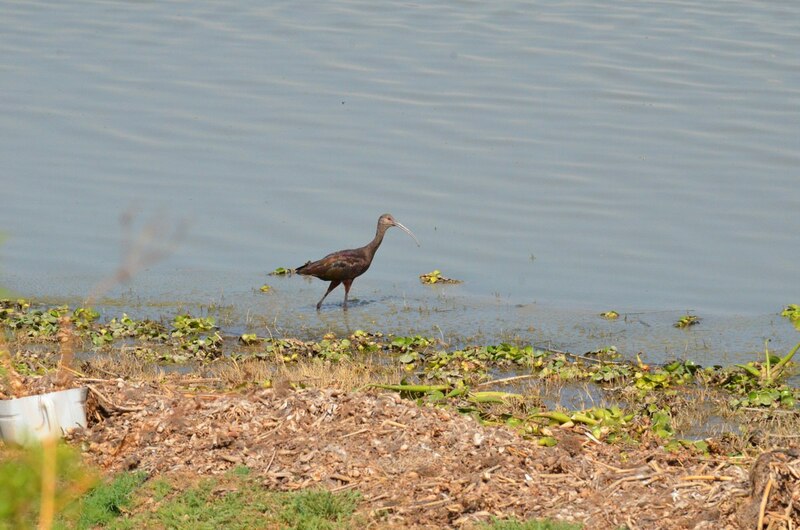 A White-faced Ibis is a medium-sized wading bird that is between 46-56 centimetres (18-22 in.) tall with a significant wingspan of one metre (39 in.). It is during breeding season that a band of white feathers is seen bordering a bare red or pink face. 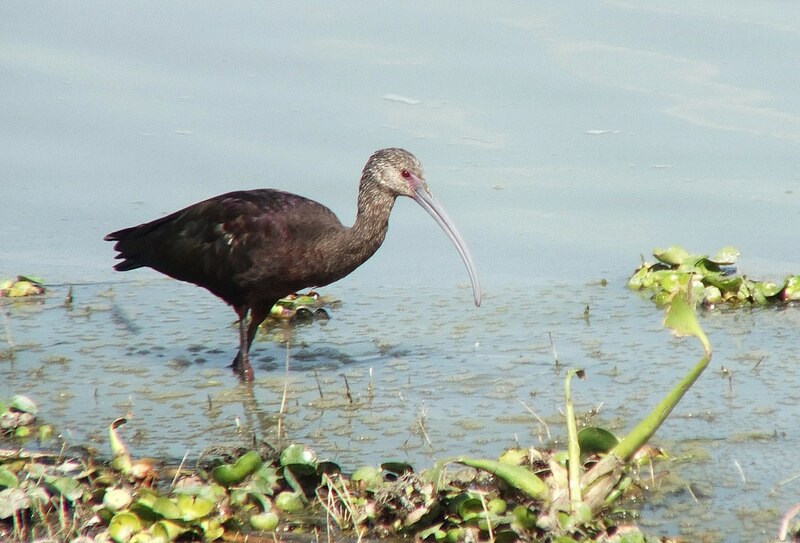 This is an adult ibis detectable by the red eyes. It was a stroke of good luck that the sun was at our backs because it helped to accentuate the purple highlights of the iridescent bronze-brown plumage on the bird’s back and shoulders as well as to reveal the green shimmer on its wings and tail. 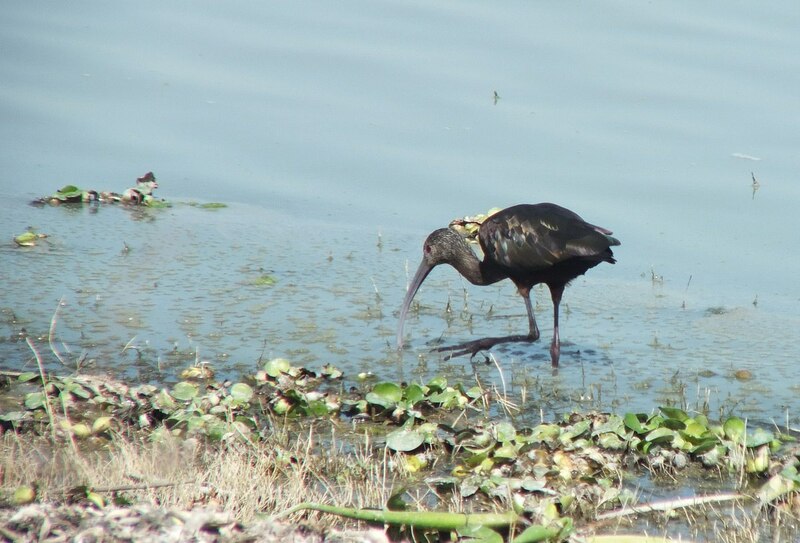 Again, we know that this ibis is not in breeding plumage because its legs are grey rather than maroon coloured. Ibises take comfort in foraging alongside taller wading birds such as herons and egrets because their added height affords them a better view of incoming predators. When I managed to tear my focus from the White-faced Ibis, it was evident that quite a variety of other birds were making their homes there on Lake Cuitzeo. There were numerous Great Egrets (Ardea alba) sharing the shallows, and they similarly benefit from the presence of the White-faced Ibises. By prodding the mud, the White-faced Ibises spook frogs and unearth other critters that dart away only to be nabbed by the ever-watchful Egrets. I couldn’t believe that there was so much activity going on just below us where we sat at the edge of the freeway. 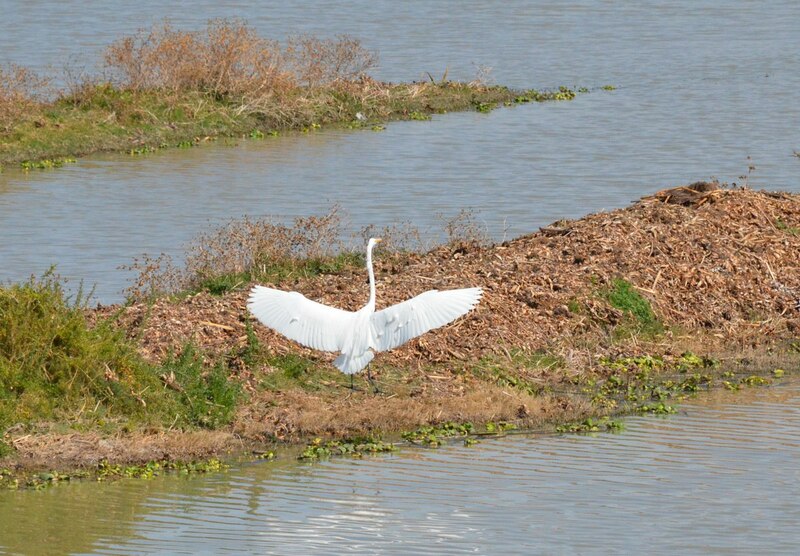 One after another, graceful Great Egrets with their impressive wingspans glided to a soft landing on the various strands running parallel to the shore of the lake. 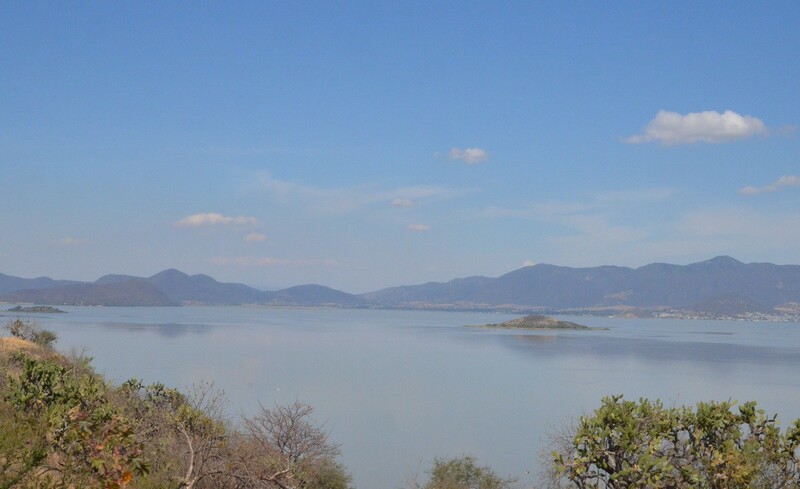 Lake Cuitzeo has an area of between 300-400 square kilometres and is the second largest freshwater lake in Mexico. 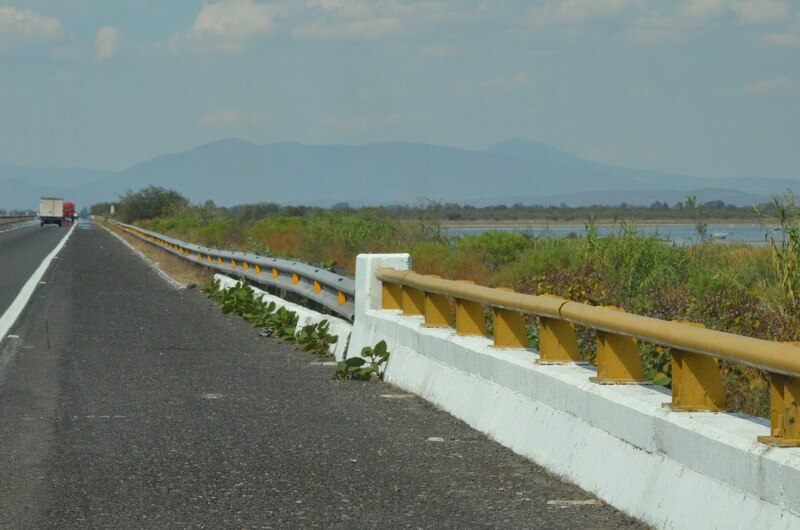 Its irregular shape is divided into northern, western and eastern sections that are connected by a central marshy area. We only had a view of the smaller eastern section of the lake. 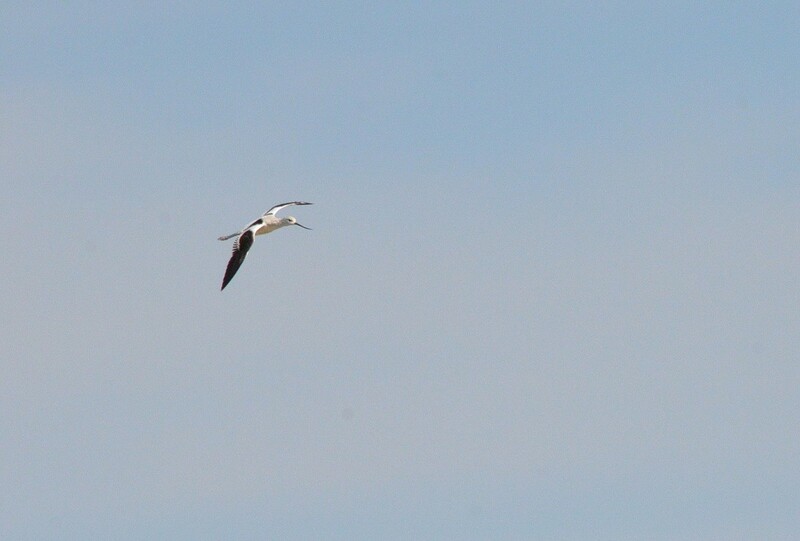 an American Avocet caught my attention, my eye drawn to the black and white striped pattern on its wings and back. 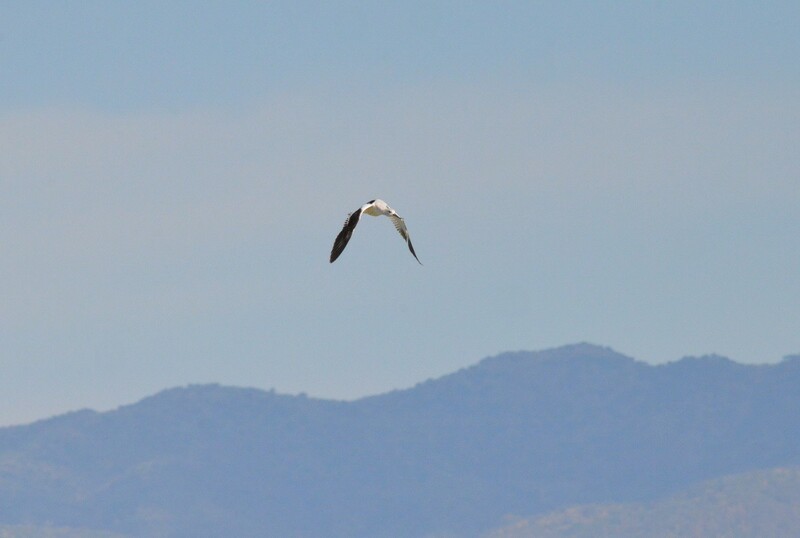 At the time, I did not notice its long, thin, blue-grey legs and feet stretched out behind its soaring body, not until I looked back at my photos. It was the upturned end on the Avocet’s long, thin bill that helped me distinguish this bird from other species in the area. Like the White-faced Ibis, the Avocet’s bill is crucial to its ability to find crustaceans and insects, but in the Avocet’s case, the bill is moved from side to side in a sweeping motion using its sense of touch to nab aquatic insects and midge larvae. It is only during breeding season that American Avocets display the beautiful cinnamon colour on their necks and heads. I will have to wait until they migrate north where they breed on mud flats, prairie ponds, shallow lakes and freshwater marshes for any chance of seeing one in breeding plumage. 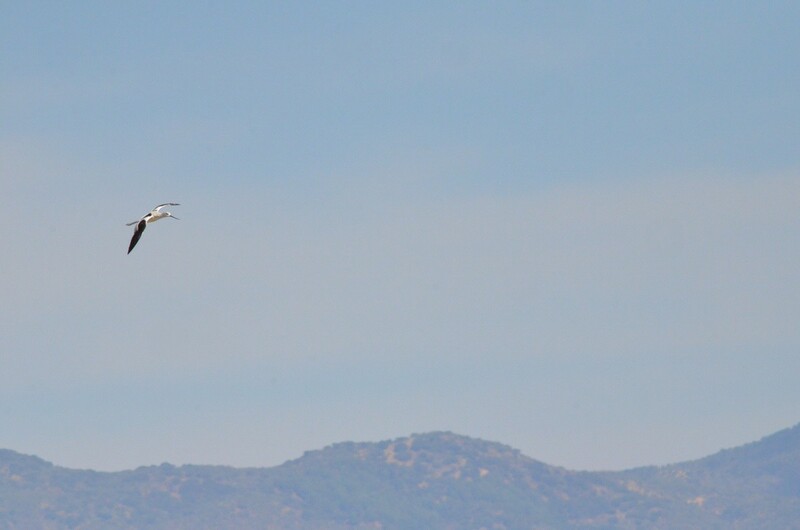 The American Avocet did not come in for a landing anywhere within my range of vision, but Bob and I felt very lucky to have seen it at all. Its body is a mere 40-50 centimetres (16-20 in.) long with a wingspan of between 68-76 centimetres (27-30 in.). The bird was quite impressive with its elegant profile and splendid coloration. 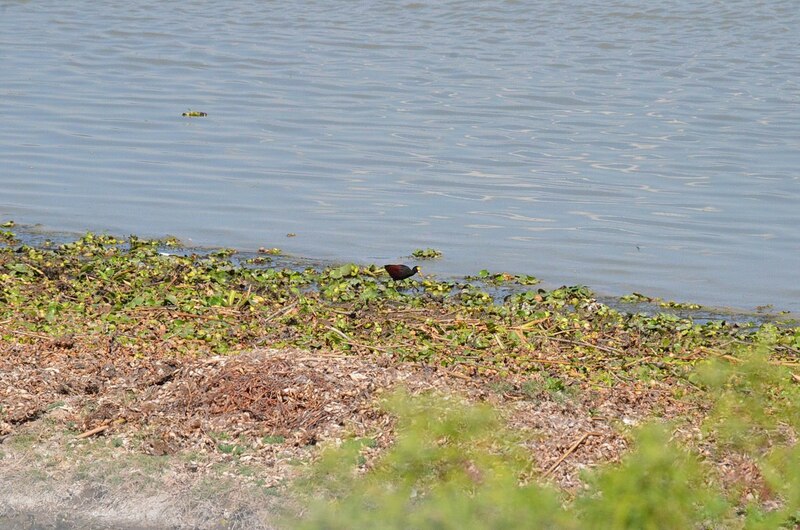 we discovered that it had been joined by another bird foraging amongst the aquatic plants. 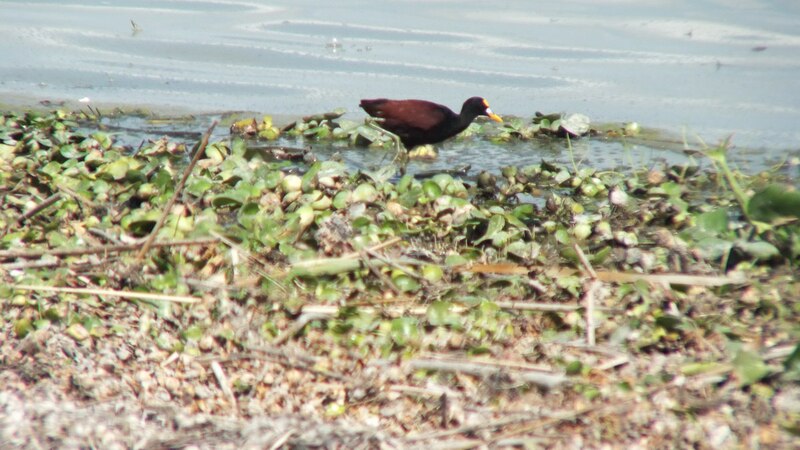 Unfortunately, our photographs of this Northern Jacana are few and not of the best quality. I found that my camera struggled to focus because of the car’s vibration and turbulence from passing vehicles, but also, in my excitement, I probably did not practice much patience. Neither Bob nor I had any idea what we were looking at and had to reference our bird book. This wetland bird’s huge feet and claws were diagnostic. 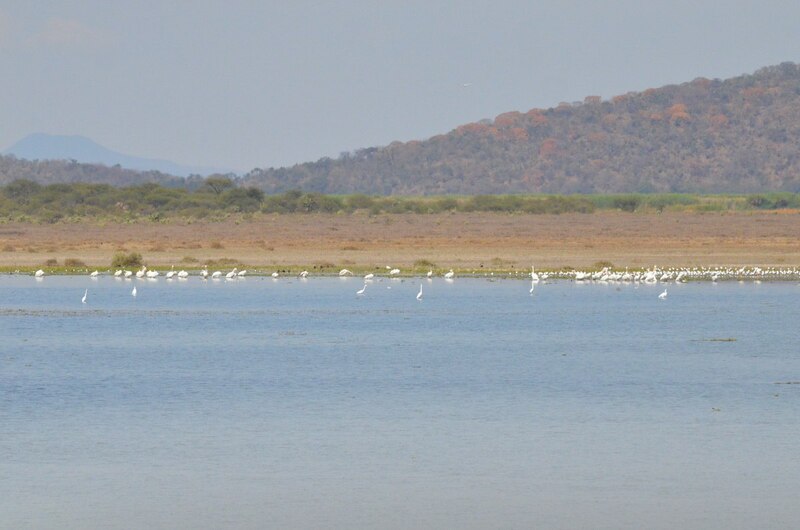 It is those features that allowed this specimen to walk on top of the vegetation floating along the edge of the lake. but it would have been too dangerous to exit our automobile even for the pursuit of better photographs and improved angles. 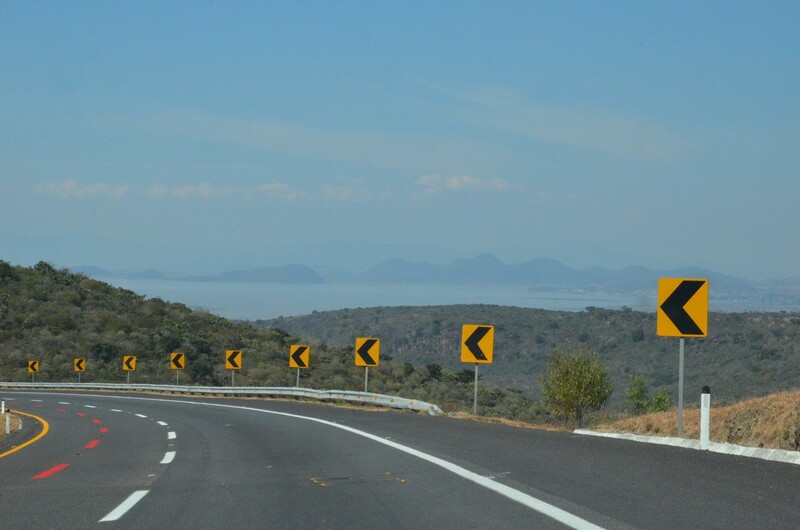 The speed of passing vehicles was frightening, and we had to get moving ourselves. 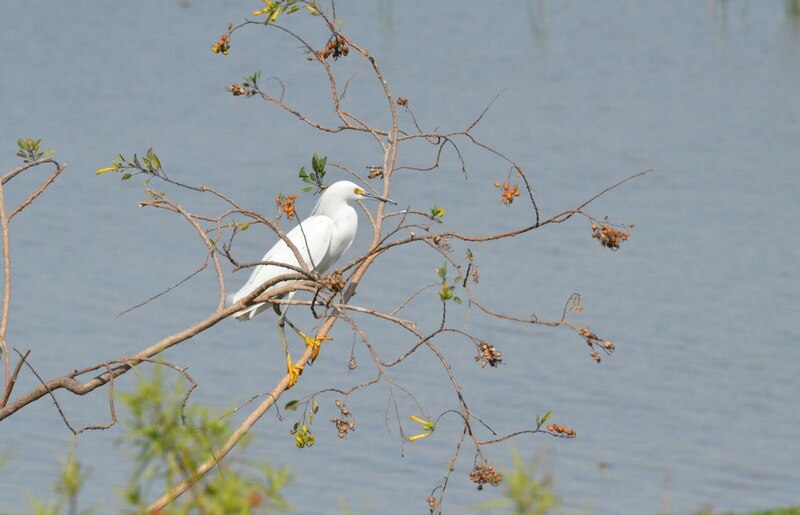 Before we could pull back onto the pavement, a gorgeous Snowy Egret alit in a nearby tree. 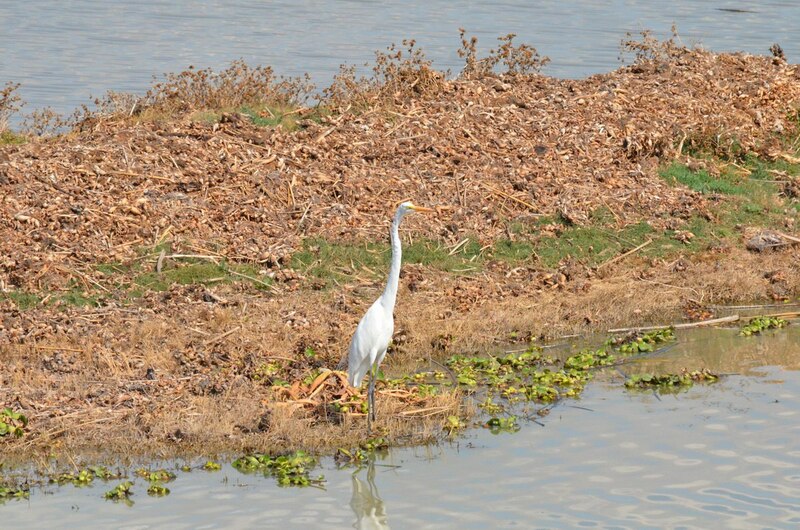 These elegant herons have immaculate white plumage that is set off by black legs and bright yellow feet. Given that the legs on this egret have a greenish hue and the bill is not fully black yet, I would say that it is a juvenile. These medium-sized egrets also forage in the shallows but are apt to spear fish and other aquatic prey with their long, slender bill. I could not have asked for a better diversion from the long, tedious drive to our day’s destination. 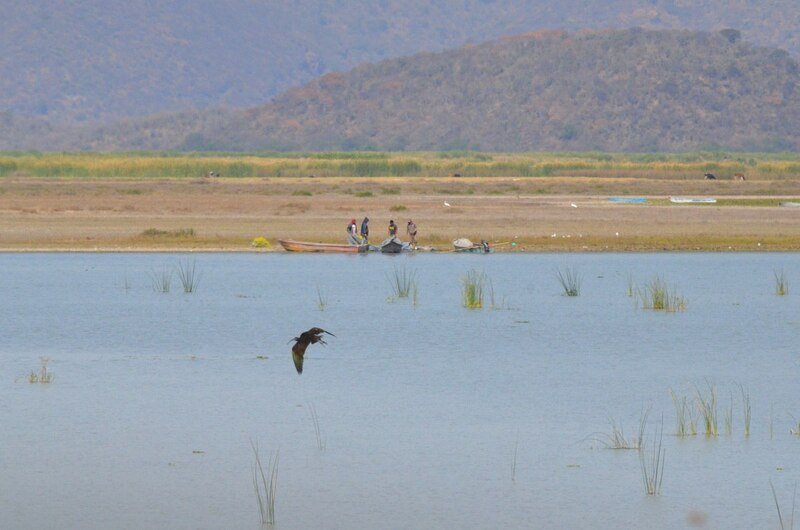 Lake Cuitzeo is rich in atmosphere and bird species. We would like to revisit it for a more in-depth exploration of the unique habitat that it provides.